Hubbell Homes is constructing single family homes in the Crosshaven residential development, located just north of Des Moines in Johnston, Iowa. Recently, Johnston received national recognition as one of the best places to live, including the ranking of top suburb in Iowa by Business Insider. Crosshaven offers low cost housing, neighborhood safety, award-winning schools, and convenient access to nearby retail areas and Interstates 80 and 35. Recreational opportunities in the area include parks, recreation center facilities, a 35-mile trail system, and Saylorville Lake which provides abundant opportunities for swimming, boating and fishing. 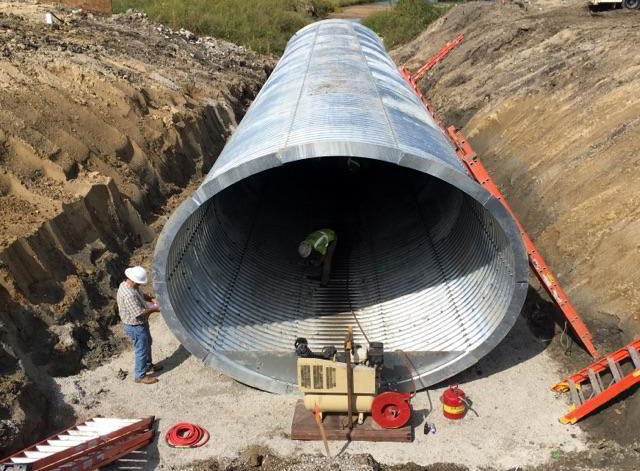 During the planning stages of Crosshaven Plat 7, it was determined that a large concrete box culvert would be necessary to convey the 100 year storm flows. Hubbell Homes and McClure Engineering searched for an economical alternative that would attract potential home buyers. As luck would have it, McClure Engineering was already talking with Contech Engineered Solutions about other site solutions when the question arose. McClure and Contech went to work in sizing an option that checked both the aesthetic and economical boxes. After careful consideration, a Contech 14'-11" x 11'-2" MULTI-PLATE® Ellipse, 90' in length, with aluminum headwalls and wingwalls was selected as the best solution. The approval process with the city of Johnston was challenging, but in the end, the experience, patience, and attention to detail provided by McClure and Contech earned the city's blessing. In keeping with the visual enhancement theme, a stone veneer was added to the headwalls and wingwalls. The structure was erected on the site in less than a week, providing the city and Crosshaven development with an eye catching crossing. Untimely rains made job site conditions difficult but the lightweight nature of the MULTI-PLATE system made the construction process more manageable.